A consortium made up of Marubeni Corporation (project integrator), the University of Tokyo (technical advisor), Mitsubishi Corporation, Mitsubishi Heavy Industries, Ltd, Japan Marine United Corporation, Mitsui Engineering & Shipbuilding Co., Ltd, Nippon Steel & Sumitomo Metal Corporation, Hitachi, Ltd., Furukawa Electric Co., Ltd., Shimizu Corporation and Mizuho Information & Research Institute, Inc. have been participating in an experimental offshore floating wind farm project sponsored by the Ministry of Economy, Trade and Industry since March 2012. 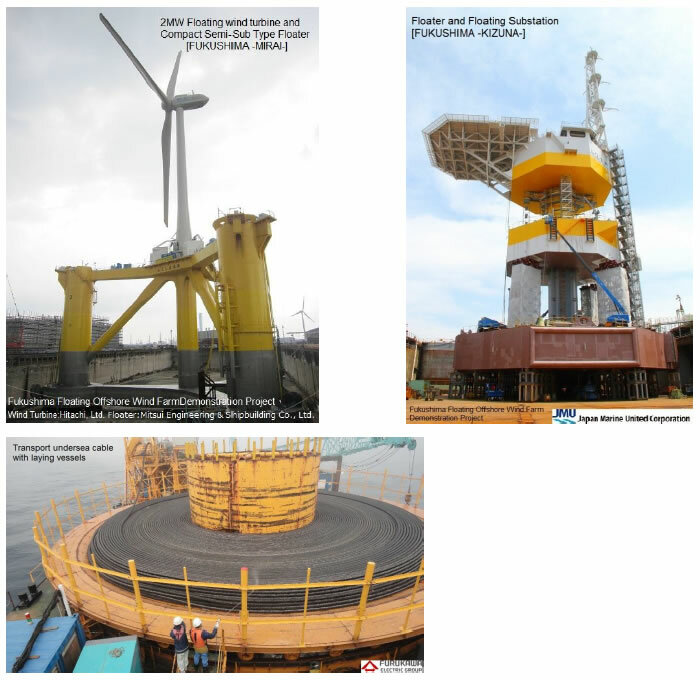 At present, the construction of the floating power facility consisting of a 2MW downwind-type wind turbine and a 4 Column Semi-Sub as part of Phase I has been successfully completed and their delivery to Fukushima has started today. Setting one 2MW downwind-type floating wind turbine, the world's first 66kV floating power sub-station and undersea cable. Mounting wind turbine on floating compact semi-sub at Mitsui Engineering & Shipbuilding Co., Ltd. Chiba Works. Setting up of the anchor chains. Construction of the 66kV floating power sub-station at Japan Marine United Corporation, Yokohama Works. Delivery of the undersea cable from Furukawa Electric Co., Ltd Chiba Works to Onahama port, Fukushima.